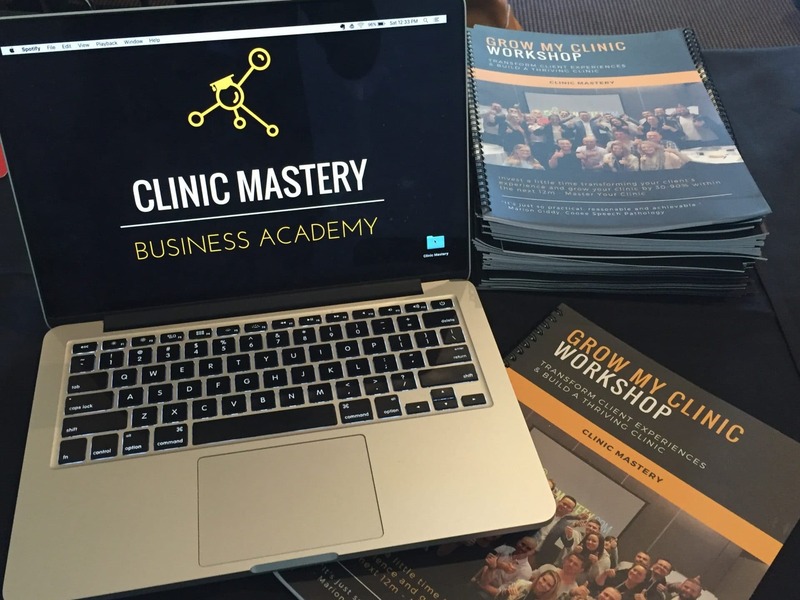 As a clinic owner, it can be difficult to stay up to date with the wide ranging advancements in evidence based practice and the latest business building strategies, so that’s why the Physiotutors and Clinic Mastery have partnered together. If you’re a Physiotherapist, then you’re probably looking to refine or research the best methods for assessing your patients so that you give the best diagnosis, create better treatment plans and deliver better clinical outcomes. Andreas and Kai from the Physiotutors are on a mission to offer you (student or practitioner) a consistent and reliable high-quality source for educational physiotherapy content. 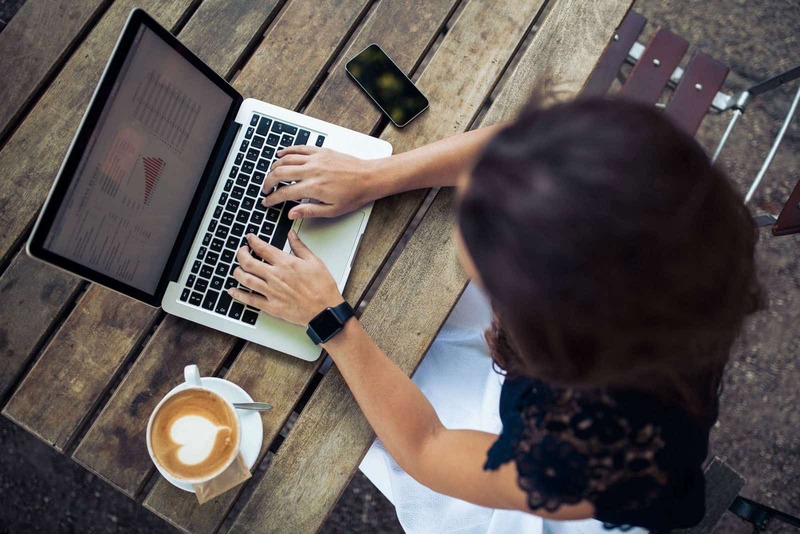 From online courses, videos, evidence from the latest research articles to the latest news around the physiotherapy profession and helpful tools for your practice or studies. The great thing for you is that your able to study at your own pace, anywhere in the world. If you’re wondering what to do in your regular in-house professional development sessions, you and your practitioner team can be directed by the free online content from Physiotutors and Clinic Mastery. The great thing is that you’re able to directly connect with the Physiotutors online so that you can get your questions answered. After working with 100’s of private practice owners and as part of our Business Academy, we realise how valuable it is for practitioners and clinic owners to have the support, resources and content they need to get better clinic and patient outcomes. In this article, I’m going to share how you can get the most out of the Clinic Mastery and Physiotutors education partnership. Imagine being able to access thousands of hours in content and expertise from the click of a button?! As you know the social media platforms now allow you to connect with amazing people, like Andreas and Kai from Physiotutors. You should probably connect on all of these social channels so that you can ask your questions and follow their journey. You first step should be to connect with the Physiotutors on social media. You’re going to get even more value when you have access to their Orthopaedic Assessment Book. Remember I said that you can get it all from the click of a button…! 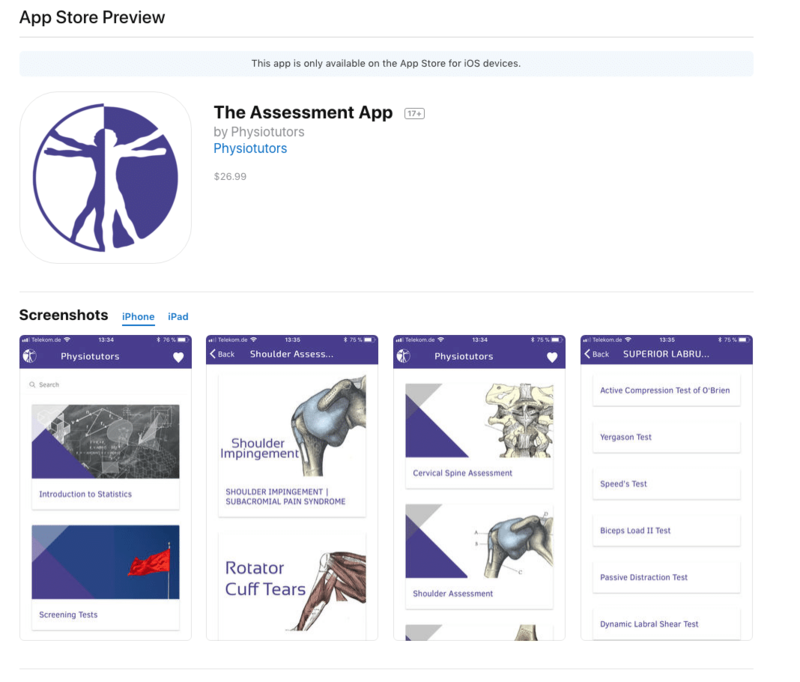 Now, you can get the Physiotutors mobile app, it makes it even more convenient for you. Are You Open For Work Experience Students? 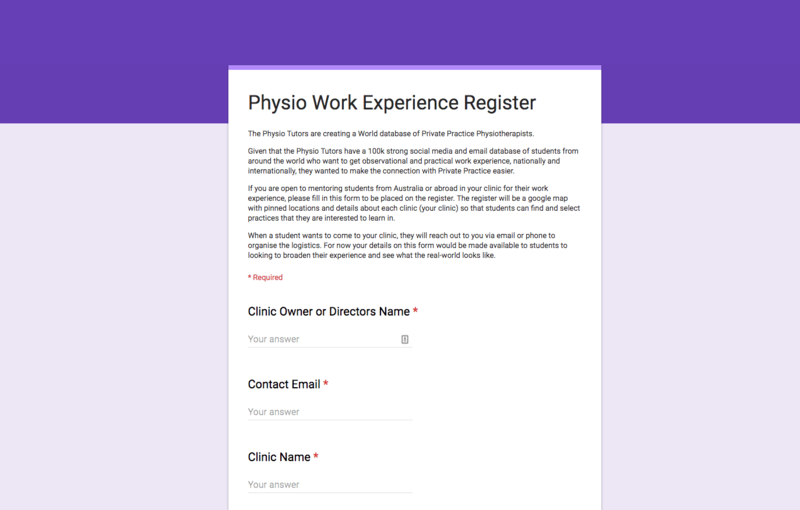 If you’re looking to find a new physiotherapist, then one of the best ways to observe if they are the right fit is for them to do work experience in your clinic. Perhaps, you’re just looking to give back to the profession and help a younger colleague learn the skills of the trade. Either way, you’re probably going to be interested in this. The Physiotutors and Clinic Mastery are creating a world database of Private Practice Physiotherapists. You may have noticed that the Physiotutors have a 100k strong social media and email database of students from around the world. Many of these students are looking to get observational and practical work experience, nationally and internationally, so we want to make it easier for you to connect with them. If you are open to mentoring students from Australia or abroad in your clinic for their work experience, please fill in this form to be placed on the register. What Happens When You Join The Register? The register will be a Google Map with pinned locations and details about each clinic (your clinic) so that students can find and select private practices that they are interested to learn in. When a student wants to come to your clinic, they will reach out to you via email or phone to organise the logistics. For now your details on this form would be made available to students to looking to broaden their experience and see what the real-world looks like. You will have the pleasure of giving them a great learning experience and possibly creating a job opportunity for them once they have graduated. You can become a better practitioner and clinic owner by keeping connected and engaging with the Physiotutors and Clinic Mastery. Your practitioner team and admin team can also learn a lot by using the practical education from this partnership. It can help guide your in house training and development of all team members.